Our tiniest clients always want to keep moving during their portrait sessions. They've been waiting so many months to get up on those feet and walk around just like Mom, Dad and their big brother or sister, so why would they want to sit down and stay still? 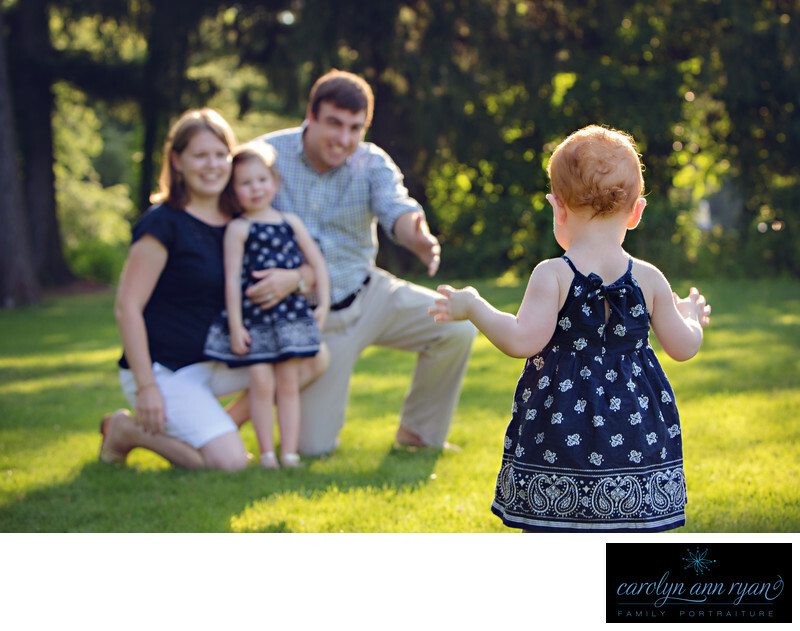 I completely understand, and sitting still is not what happens during a family portrait session with Carolyn Ann Ryan Photography. Because, I wouldn't want to miss these little moments. What do I love about this image? Everything. But I'd have to start with the adorable red curls of this tiny little munchkin. My heart jumped into the air and did flip-flops when I arrived at this session and saw these two beautiful little sisters - blond hair and red curls! It was cuteness times two. Then Mom paired these girls in sweet, summer dresses and sandals. But I also just adore this moment. Everyone is ready and here comes little munchkin - carefully taking those baby steps back to Daddy's arms, while he waits smiling and ready for his hug. Keywords: backlight (39), blue (138), Charlotte NC (180), Family (171), Family Portraits (159), girls (165), Navy (51), plaid (105), red hair (12), Summer (69). 1/320; f/5.0; ISO 400; 70.0 mm.